Garden design has been an important Japanese art for many centuries. Traditional Japanese landscape gardens can be broadly categorized into three types, Tsukiyama Gardens (hill gardens), Karesansui Gardens (dry or rock gardens) and Chaniwa Gardens (tea gardens). For an expat living in Japan a visit to a Japanese garden would offer an insight to several string themes in Japanese culture and Zen Buddhist philosophy, including an appreciation of discipline, a respect for art and nature and a desire to pursue quiet contemplation. Landscape gardens use ponds, streams, hills, stones, trees, flowers, bridges and paths to create miniature reproductions of natural scenes, often of a famous landscape in Japan. The name Tsukiyama refers to the creation of artificial hills. Tsukiyama gardens vary in size and in the way they are viewed. Smaller gardens are enjoyed from a single viewpoint, such as the veranda of a temple, while larger gardens are best experienced by following a circular scrolling path. Suizenji Koen in the town of Kumamoto is a beautiful example of a hill garden. A circular path leads visitors around the garden, past lakes, sculpted trees and even a miniature Mt Fuji. Parts of the garden date back 400 years. Perhaps the three most noted landscape gardens include Kenrokuen (in Kanazawa), Kairakuen (in Mito) and Korakuen (in Okayama). Kenrokuen used to be the outer garden of Kanazawa Castle, constructed over 200 years and opened to the public in 1871. The water for the many streams and rivers of the park is diverted from a distant river by a sophisticated water system constructed in 1632. The name Kenrokuen literally means “Garden of the Six Sublimities”, referring to spaciousness, seclusion, artificiality, antiquity, abundant water and broad views, which according to Chinese landscape theory are the six essential attributes that make up a perfect garden. 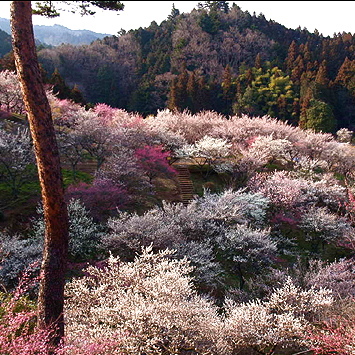 Kairakuen is most famous for the three thousand plum trees making February and March the most incredible time to visit. The Mito Plum Festival (Mito Ume Matsuri) is held annually from February 20 to March 31. Unusually, Kairakuen was built in 1841 and was built not only for the enjoyment of the local lord, but was also open to the public. Kairakuen means “park to be enjoyed together”. Okayama’s main attraction is Korakuen, a beautiful landscape garden beside Okayama Castle. The local lord ordered the construction of the garden in 1687 as a place of entertainment for the ruling family and a location for receiving important guests. The public was allowed to enter the garden on certain occasions. Korakuen was opened to the public in 1884and has suffered damage from floods and bombs during WWII but detailed records have allowed for accurate reconstructions. Unlike most Japanese gardens, Korakuen has spacious lawns. Karesansui gardens are typically associated with Zen Buddhism and reproduce natural landscapes in a more abstract way by using stones, gravel, sand and sometimes a few patches of moss for representing mountains, islands, boats, seas and rivers. Karesansui gardens are strongly influenced by Zen Buddhism and used for meditation. Two of the most famous rock gardens in Japan are Ryoanji and Nanzenji both in Kyoto. Ryoanji is Japan’s most famous Zen temple with a beautiful rock garden, the most famous of its kind in Japan. The simple Zen garden consists of nothing but moss, rocks and carefully raked gravel. The meaning of the garden’s arrangement is not known; therefore each visitor must make a personal interpretation. Nanzenji is a Zen temple at the foot of Kyoto’s eastern hills. It is one of Japan’s most important Zen temples. Its main building, the Seiryo-den, is famous for a beautiful rock garden and sliding doors, which are decorated by paintings of the Kano School. These are the tea gardens and are found in various places in Japan. The tea or the Chaniwa gardens were introduced in Japan once the tea ceremony was developed in the 14th century. The emphasis of the Chaniwa gardens is to have an atmosphere solitude and detachment from the world, one that matches the simplicity of the tea ceremony. The tea gardens are very simple in decoration. The garden has a tea ceremony house connected and the tea ceremony is performed there. The attendants of the tea ceremony use the stone basins also known as Tsukubai, which are present in the tea gardens, for the purification purposes. These types of gardens contain stepping stones that lead towards the house, they also have stone lanterns and a wash basin made of stone- this is where guests purify themselves before taking part in the tea ceremony. Most Chaniwa gardens are not open to the public, but influences from them can be seen in many larger gardens, such as Happo-en in Tokyo.